Monfragüe is a small National Park in Extramadura Province in Western Spain and a relatively new National Park at that. On our first trip here we took a a guided trip (arranged through reception at the campsite) – 4pm to 8pm – and had a good time with guide Natalia and Ellie & Peter, a Dutch couple. Natalia took us to an excellent Griffon Vulture site near one of the dams, and then a second site on the Trujillo road. We also saw Black Vultures and a Spanish Imperial Eagle. 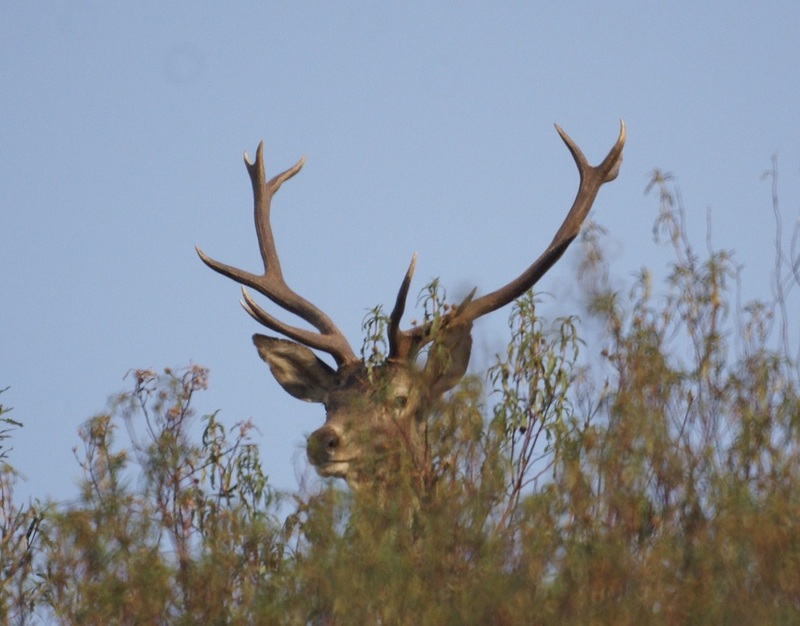 We saw a lot of Red Deer (including some big stags with huge antlers) and we went through a private estate which had a lot of the black pigs which eat acorns and provide the meat for the Iberico ham. We ended up with a picnic at sundown at a point providing an excellent view of the countryside. The environment called ‘dehesa’ looks very like parts of Africa – you half expect to come across a herd of elephants. While at Camping Monfrague we went in the van to Trujillo about 75 kms away– a remarkably pretty small town. It's a bit of a back road with the odd hair pin bend but a quiet road and manageable even in a large van. We parked on the street and then had a look around the town. The Plaza Mayor was a particular delight and there was a status of Pizarro to celebrate the fact that he was born there. We wandered the streets and explored a huge Moorish castle, now complete with a virgin which rotates if you put money in a slot. We almost got the sniggers at that. We took the green walking route from Villareal de San Carlos. A brochure with the walking routes is available at the tourist info office there. The route was fairly tough – you are fairly quickly scrambling over bare rock or climbing steep ‘steps’ in the rock, and there is a 1200 foot climb to the Cerro Gimino viewpoint. Fantastic views, and vultures flying below you. We took a fair bit longer than the advertised time, and were knackered by the time we got back, but we did spend a lot of time watching birds. In addition to the usual suspects we saw a pair of Hawfinches (a first for us), a Firecrest, lots of Dartford Warblers, a snake (about as thick as a finger and a couple of feet long) and a bunch of dung beetles clearing up some horse manure. We went back to Villareal de San Carlos again to do part of the red route (just down to the Puente del Cardinal which was built in 1450). Again fairly tough walking – we only did about 2½ miles but it took about 3½ hours because we spent so much time watching deer and birds. We saw more Firecrests, a Cuckoo, a Short-Toed Eagle, a Black-Winged Kite, Pipits, Rock Buntings (another first for us), Crag Martins (again a first, an Irish feller in the bar told us about them last night). There is a third walk up to the old Muslim fort at the top of a steep cliff, not as bad a walk as we were expecting, the walk up is under cover of the trees and is quite pleasant. The spectacular view from the top is well worth the effort. However if you don't want to make the effort there is a car park half way up the cliff and the walk to the castle is much shorter. We stayed at Camping Monfrague which is just south of Plasencia. When we were there in November it was pretty quiet but it has free wifi and a good restaurant which is frequented by locals so the menu del dia is good and cheap. It was from here that we could arrange our guided tour of the national park. When we were there last a greasy pole was put in place overnight for the reasons shown in the video below. On other occasions we have seen the first day of the hunting season with the local huntsmen and women in their best hunting gear congregating at the campsite before heading out for things to kill. On sunday afternoons the neighbours all gather on the shady terrace to enjoy family gatherings, a hand of cards and maybe a trip home on the family horse and carriage. Since that first visit we have visited this area at least once a year, to get our fill of vulture watching, more recently we have had our scooter with us which has enabled us to travel a bit further and catch sight of the Spanish Imperial Eagles. I took this video October 2012 when we were at Monfrague campsite in Spain. On top of the greasy pole is a whole jamon - well worth effort. This is a cork oak, and you can see that the cork has been harvested relatively recently. The cork bark is removed every 10 years and as you go through the cork oak woods you can see that the trees are numbered as a method of ensuring that the cork is harvested at the righ intervals. With cork oak come black pigs used for making jamon, the pigs eat the acorns from these trees. With the coming of the screw top and the plastic cork one wonders what will happen to these trees in the future but around Portugal you do see a range of cork products made for the tourist market. The scenery in Monfrague can be beautiful but the advertised walks can be quite strenuous - more of a scramble than a gently stroll. 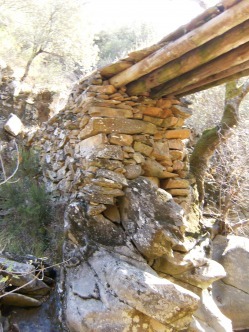 On one of our walks we came across this stone bridge or ponte de piedra ( stone bridge to you ). In essence it is a dry stone bridge - same technique as for the walls and is a traditional form of building here. This is Sheila at a viewpoint, a high spot ( literally) of one of those gruelling walks. 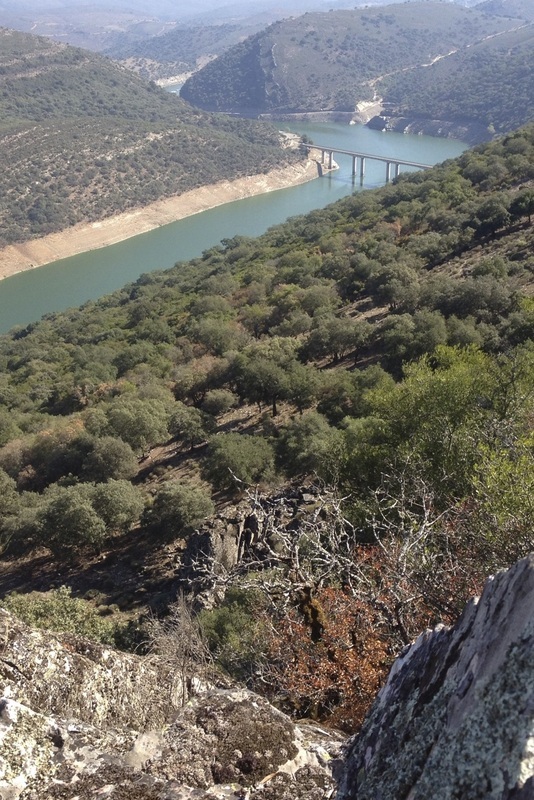 This is at 372 metres and the River Tajo is below. Griffon vultures were plentiful here.